Do you know what the biggest new trend of 2019 is? It’s QUOKKAS! Finally the ‘teens feature a popular movement that Ferrebeekeeper can get behind. Quokkas are cat-sized marsupial herbivores of the genus Setonix, a genus which has only a single species Setonix brachyurus. Quokkas are most closely related to kangaroos, wallabies and pademelons: together these animals make up the family known as macropods. Quokkas weigh from 2.5 to 5 kilograms (5.5 to 11 pounds) and live up to 10 years. They have brown grizzled fur and live on a variety of vegetation native to their little corner of southwest Australia. Wikipedia somewhat judgmentally notes that they are promiscuous. Females usually give birth to a sole joey which lives in their pouch for 6 months and remains dependent on the mother for several months beyond that. Quokka populations have declined precipitously since Europeans colonized Australia. They are outcompeted and preyed on by invasive cats, foxes, and dogs, and they have suffered extensive habitat loss to farms and homebuilding (plus they have some native predators such as snakes). The great Jerusalem for the quokka is Rottnest Island off the coast of Perth. Rottnest means “rat’s nest” in Dutch (which I feel like I could learn!). Apparently the 17th century Dutch explorer, Willem Hesselsz de Vlamingh, spotted extensive colonies of quokkas on the island and mistook the creatures for giant rats. So why is this dwindling macropod suddenly so popular? Quokkas do not have a particular fear of humans (an exceedingly unwise outlook, in my humble opinion). Additionally, because of the shape of their faces, they seem to have satisfied chilled-out smiles. Indeed, they might actually have chilled-out smiles (they seem pretty benign and happy), but no quokkas returned my phone calls, so I can’t speak to their true emotional state. Anyway, the combined lack of fear of humans and the endearing smiles make them perfect in “selfies” and adorable digital animal photos. The internet is thus good to the quokkas whose popularity is soaring by the day. Perhaps they can parlay this digital fame into population growth and success in the real world (although I suspect the internet’s content-makers would caution the quokka that there is limited correlation between digital and real-world success). Now that you have read the little essay, here are some adorable grinning quokka pictures. I really hope these guys flourish because just look at them! Best wishes for a Merry Christmas! I am featuring my Christmas tree again, just in case anyone hasn’t seen it. Fortunately, I added a lot of new animals like an andrewsarchus, a basilosaurus, an arsinoitherium, and a priapulid worm. Of course my favorite animal, my little housecat Sepia is there too, at lower left, wondering why I am paying attention to a fake tree instead of playing with her. It seems like she might also be interested in a second dinner. The year is wearing down fast and I am going to take a few days to paint and draw and relax, but there are a few more posts left for 2015 and then there will be a whole new thrilling year for blogging. Having you all as readers is the very best present possible. Let me know if you have any ideas or concerns. Happy holidays! I wish I could get everyone a miniature donkey, or a flying squid, or a walking catfish, but you will have to settle for more wacky eclectic content…and for my happiest and best wishes and warmest regards now and always. The success of my mixed media turkey artwork has led me to make a second cut-out paper bird. This one is a beautiful peacock pheasant with iridescent tail feathers and with rhinestone “eyes” across his breast. The real bird which this cutout is based on is the grey peacock pheasant (Polyplectron bicalcaratum) the national bird of Myanmar—a nation clawing its way from horror to democracy. One of these days I will do a post on the gray peacock pheasant (which is not unlike the beautiful Palawan peacock pheasant, which I already wrote about), however I am going to wait a while. The actual animal is so gorgeous that it puts my paper cutting to shame…. Today Ferrebeekeeper abjectly drops all discussion of space exploration, art, literature, zoology, and history in order to concentrate on the biggest trending topic of the day–a disquieting animated character who takes the form of a weird toothy box. What’s the story here? Well, it turns out that, McDonald’s, the globe-spanning fast-food eatery has introduced a new mascot, “Happy” a happy meal box who wants kids to eat their vegetables and yogurt. The internet is awash in jokes about Happy’s lurid color, ambiguous motivations, and his oh-so-human (and oh-so-large) teeth. Mascots have been a subject of great interest to me ever since the black-and-white TV introduced me to the McDonaldland gang when I was a bright nervous child so I feel like we can do better for Happy (well, better than Gawker’s boilerplate jokes at least) and unpackage some of his history. McDonald’s is an American restaurant (actually considering its name & its obsession with cheap beef and potatoes, maybe it’s Irish-American) which began in 1940 in California as a barbecue joint. 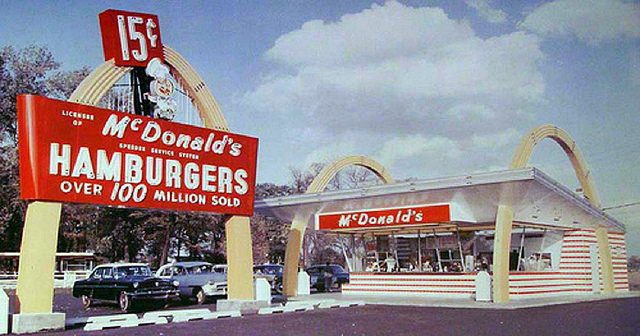 After the Second World War it changed into a hamburger restaurant and then spread its wings to become the most successful chain restaurant in history. One of the important steps of its evolution into an international corporate hegemon was developing a colorful crew of mascot characters to sell burgers, fries, and, above all, “the McDonald’s brand” to impressionable children (like me!). In the early 1970s, an advertising agency introduced a whole team of mascots collectively known as McDonaldland to the world. 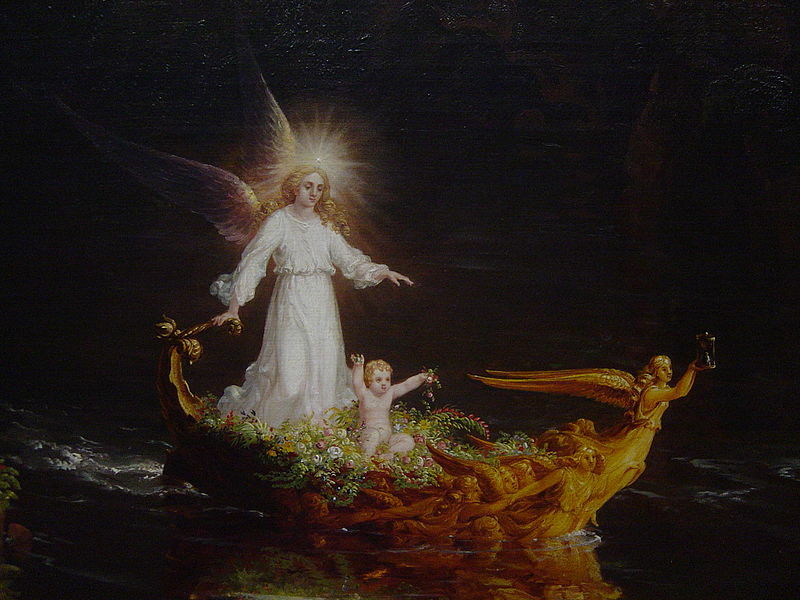 The concept was based on the drugged-up fantasy landscape of H.R. Pufnstuf (a surreal puppet show which has cast long delirious shadows over children’s programming ever since it aired). 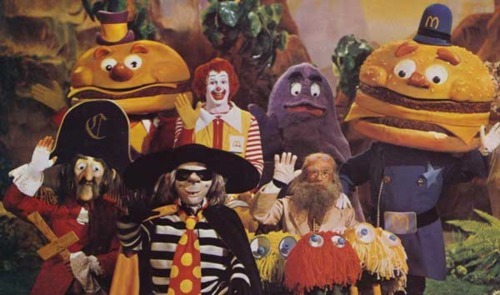 True to the source material, the original cast was a disquieting mélange of weird beings: Mayor McCheese, a corrupt bureaucrat whose head is made of a cheeseburger; Hamburglar, a muttering lunatic thief; and, of course, Ronald McDonald, the dangerous-looking clown prince of the anthropomorphized fast-food landscape. Some of the characters were quickly revised. 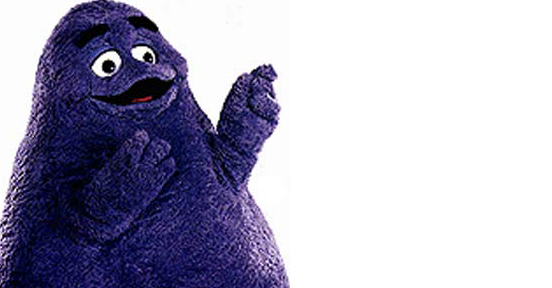 Grimace was originally a villainous purple octopus with a monomaniacal love for milkshakes. Unfortunately early consumer tests determined that children were terrified of the multi-armed abomination. 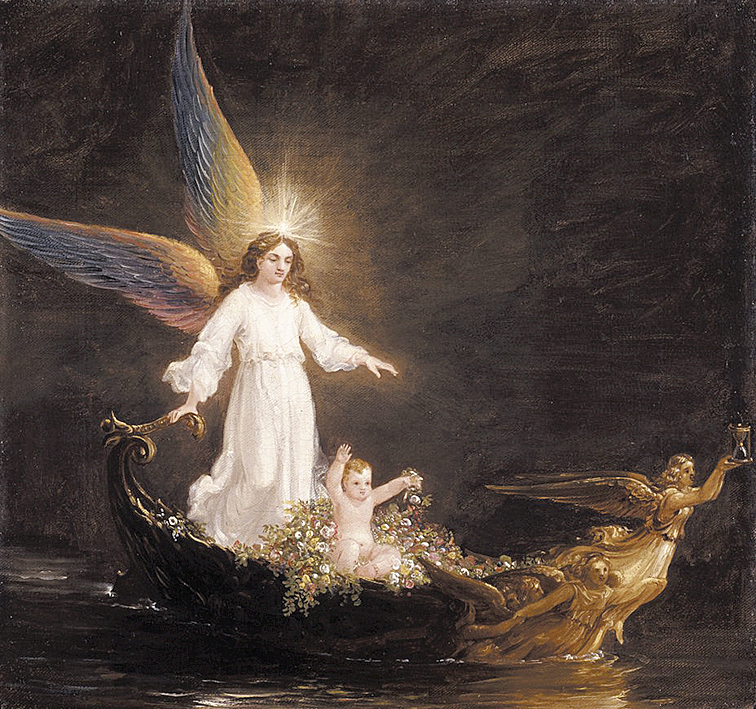 Flummoxed ad-executives were prepared to rework the entire concept, when one perspicacious adman came up with a brainstorm characteristic of the industry. “Let’s just rip his arms off!” he said. So Grimace–whom many people doubtless think of as a mitochondria or a rhizome—is actually an octopus whose arms were amputated by drunken 1970s admen. 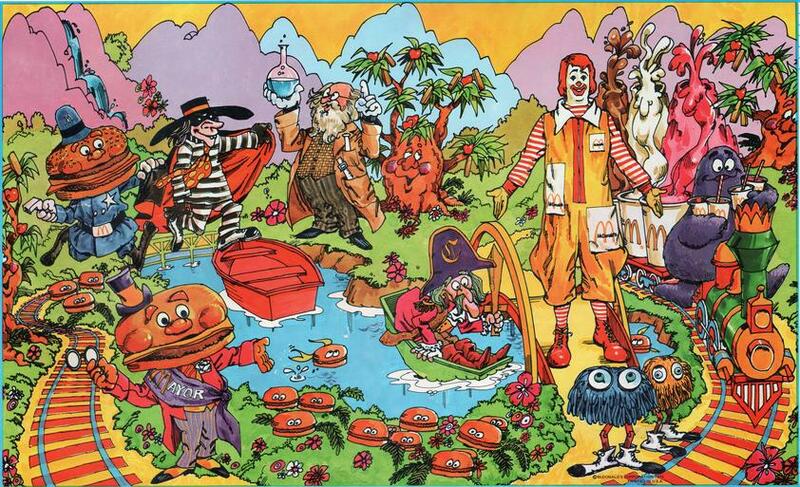 The McDonaldland gang hit their heyday in the 1980s, when they were everywhere. Figures were abruptly retired (like poor Captain Cook) or changed, while new ones such as Birdie the breakfast bird made sudden appearances. 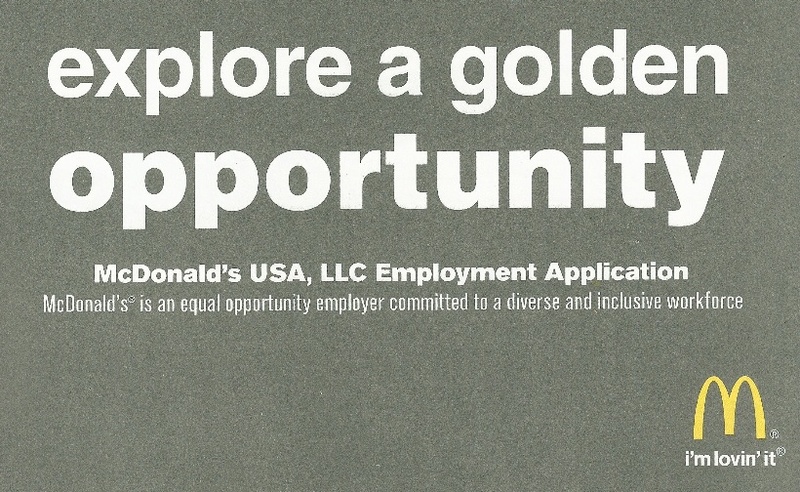 Yet times change, and contemporary McDonald’s is trying to put McDonaldland behind them. Ronald McDonald has kept his position as a figurehead (much like Mickey Mouse) and the other characters sometimes appear in weathered murals or old playground equipment, but today’s advertising concentrates on pseudo-healthy communities of friends eating together and “lovin’ it”. The happy meal, however, continues to attract children with its colorful bag and complimentary toy. It also continues to attract regulators and litigation, so McDonald’s swung into action and created Happy. The animated box started out in the minors—France and Latin America–where he (it?) attained sufficient success to leap to the American market this month. 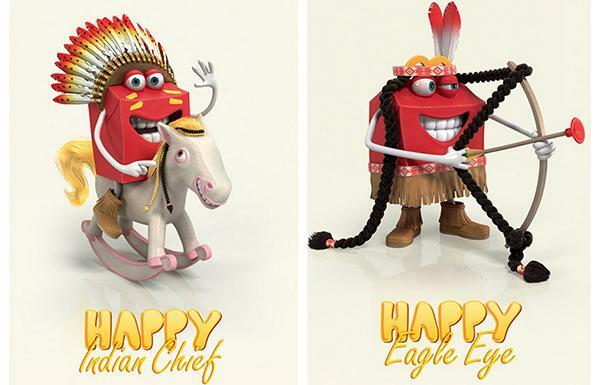 McDonald’s today introduced “Happy,” a new animated Happy Meal character that brings fun and excitement to kids’ meals while also serving as an ambassador for balanced and wholesome eating. Happy will be introduced nationwide May 23, and will encourage kids to enjoy fruits, vegetables, low-fat dairy and wholesome beverages such as water or juice. That certainly sounds admirable, but adults take one look at Happy and shudder. Moreover his true purpose is obvious to us (after all we have spent a lifetime eating under the golden arches): he is obviously meant to sell McDonald’s products to kids. It’s easy to be cynical about him—but I now look back at the strained look on my parents’ faces as they endured the burglars, killer clowns, evil octopi, and pirates of my youth with new understanding. 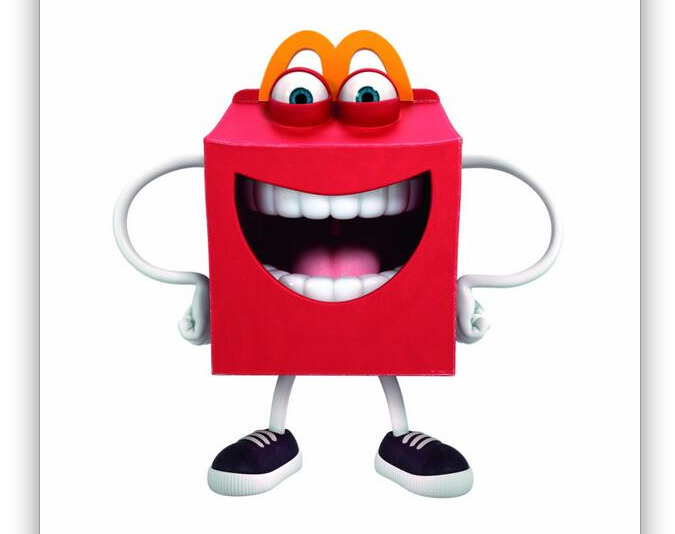 Corporate mascots are friendly monsters who entice children to buy sundry unnecessary goods and services. Kids should get used to brushing them off as soon as possible. It is fine preparation for adult life when the corporate monsters take off their googly eyes and apply their coercion more directly.